For National Better Breakfast Month, how I am loving Crunchies, they are my go-to low-cal, all-natural breakfast ingredient and they tastes delicious, too. They are non-GMO, vegan and made with nothing but fresh produce, Crunchies’ freeze-dried snacks are an easy, healthy way to add flavor to your favorite morning meals. Try topping an acai bowl with Crunchies Mango for a tropical touch of sweet, or adding Crunchies Strawberries to granola for a nutritious pop of color & crunch. If you love fruit and love convenience you are going to love Crunchies. Crunchies are freeze dried fruit that you can toss in your gym bag or keep in your desk drawer so you can always have a healthy snack on hand. Their apple cinnamon variety contains ONLY apples & cinnamon and at only 40 calories per serving- you will never feel guilty about eating them. 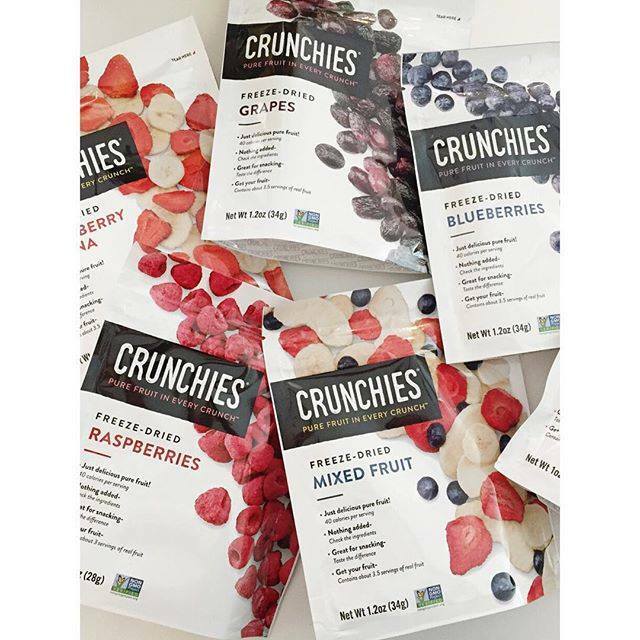 Crunchies sources their 8 delicious varieties of pure freeze dried fruit from farmers they know and trust. Tehy only pick the ripest fruit at the right time so you get the most flavor in every bite and crunch. 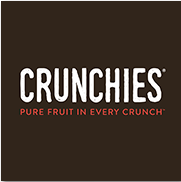 Your favorite fruit not in season, no worries with fruit Crunchies! With fabulous varieties like blueberries, cinnamon apple, mixed fruit, raspberry, strawberries & strawberry banana - you will find one that is just right for your family. Eat them right out of the bag, add to cereal, oatmeal, baking, yogurt, smoothies and more. The options are limitless! Whether hiking, biking, or just packing a snack to go fresh fruit isnt always easy to transport. Bruised bananas, squishes apples, and squashed berries can make a huge mess in your bag - but not with Crunchies. They come in simple packaging that keeps your fruit in tact and tasting amazing! The ingredient list for Crunchies is impressive! The cinnamon apple variety contains ONLY cinnamon and apples and they are low in calories. 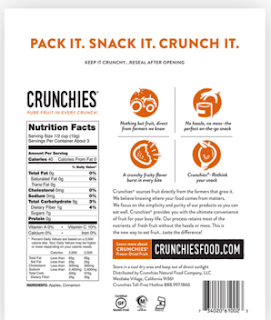 Eat healthy anywhere with Crunchies. I love the banana chips, they are light & crisp unlike other banana chips, they arent fried in oil. They are freeze dried so no added calories or added ingredients. Nothing but bananas. The raspberries are so good on cereal or yogurt. I love the crispy texture that is very satisfying!